Let the selling begin! With discount cards fundraising, the selling is the easy part, as customers are usually eager to save money on those things they purchase regularly. 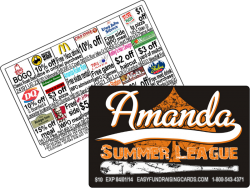 For just $10, the customer enjoys a card that lets him or her save at restaurants, the local gym or hair salon, family activities, and more for a whole year. Customers today want value; the selling is easy, and your profits grow quickly – in fact, you can raise the amount of money you need in far less time than with other methods. If you have been involved in fundraising for a substantial amount of time, you know that there are times it can really be a hassle; more work than you bargained for, profits aren’t so great, those in your group get tired of trying to sell something that customers don’t really need or want, etc., etc., etc. With fundraising discount cards, all of the hassles are removed and the profits are outstanding – plus, your group or organization gets to offer a product that customers really can use, and find valuable. It’s far more enjoyable for those involved not to have to feel like they’re “pushing” a product on people that they don’t really want. 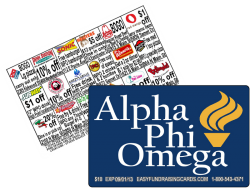 Fundraising cards have been relied on for decades by college groups like sororities, fraternities, Sports teams and clubs or organizations who need to raise money for a special project or other needs – and there are plenty of reasons for their popularity! 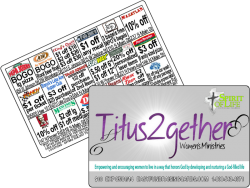 If you’re one of the many who believe church fundraising isn’t all it’s cracked up to be, consider fundraising cards. Why put forth all of the work, effort and sweat when you don’t have to? You may be new to fundraising, or you may be one of those church members we were discussing earlier who’s always involved, always ready to take responsibility. Regardless, give this tried and true method of raising money a try – it’s a sure bet you’ll be impressed. Fundraiser cards have been around for what seems like forever, and they’re still popular and effective today. Essentially, this is the ‘smart’ way to raise funds for your Marching Band, High School Band, school band, Music department and chorus group. Great for sports teams as well, fundraiser cards are highly profitable, easy to sell, and require very little work and planning when compared to other fundraising products and activities that have been used for years. 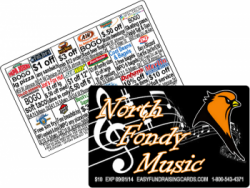 How About a Discount Cards Fundraiser? Discount cards are one of the most preferred methods for raising funds today for churches, school groups, sports teams and other non-profit organization – and it’s really no surprise. Considering their ease and profitability when compared to other fundraising products and activities, it just makes sense for those who would rather avoid the hard work and stress often found with other methods. Spirit cards are an incredible way to raise funds, whether your church or school group or sports team needs $500 or $5,000 – or even more. If you aren’t familiar with these cards, you’ll soon see just how amazing they really are, and how easy it is to raise a substantial amount of money quickly, and with far less effort than other well-known products and activities.